New York guitarist Jack Starr first rose to fame with VIRGIN STEELE. But his spell with them was not to last for more than two albums, the self titled debut and “Guardians of the Flame”. 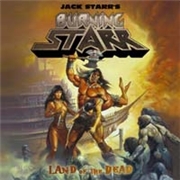 Jack stuck to his guns releasing a solo album plus four more under the BURNING STARR moniker between 1985 and 1989. Time passed and not until 2009 came the band´s return with “Defiance”. This time Jack´s back, backed by long time bass player Ned Meloni, drummer Rhino, of MANOWAR fame, and vocalist Todd Hall. Guests on the album are Ross the Boss and David Shankle, adding to the MANOWAR touch, plus Marta Gabriel of CRYSTAL VIPER. Are we in for a delightful trip in the time machine? The title track opens with a spoken voice, welcoming me to the land of the dead. Bang off into MANOWAR/VIRGIN STEELE territory and a very enjoyable ride it is. This is almost exactly as good as I thought the GUARDIAN´S OF THE FLAME album was in 2003. The back to the roots concept lingers in “Sands of Time”. The refrain is there but not the DIO gimmick from the aforementioned 2003 album. This is instead pure US heavy metal with fine refrains. The oddly short or long “Twilight of the Gods” might serve as an audience warmer at gigs with its sing-along chorus. But it is not an intro, neither a song. The US meets Europe on several occasions here, the album is like an often missing link. But the songs are not quite up to par with the superior GUARDIANS OF THE FLAME. “When Blood and Steel Collide” is not so much of a carbon copy of the members previous bands. The refrains are a focus of the band, which is favorable. The ending of the Eastern flavored “Never Again” adds a touch of Ritchie Blackmore, and the refrains of most of the eighties heroes. The power ballad “Until the End” follows suit, pointing right back to some 30 years ago. It also serves a fine display of Todd´s vocals. The album as a whole is a fine present for an eighties rocker, young or old.